Andrew Ritchie, the voice behind Martha Moments, a beautiful blog about all things Martha Stewart, was a featured guest on her television show in January... appropriately, the topic was blogging. How about a fabulous paper mache peacock with its tail composed of bright orange chopstick wrappers and plastic spoons?! 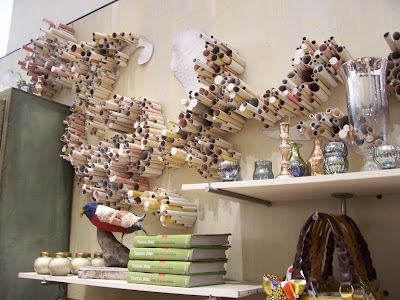 A meandering, scrolled wall design and nifty bird... A fab elephant and fish with layers of paper scales. And lastly, here's a very cool ostrich from Andrew's own Toronto store. Such clever people, those Anthro stylists! wow! this is some amazing stuff! Awesome, Ann!!! Love these pics, especially the peacock. So inspiring to me! Thanks for sharing, we don't have any Antropology stores where I live but I wish I could go when I see this! Aww, thanks everyone, I'm happy you enjoyed the post. Andrew, thanks again for sharing your pics. Wow - cool stuff! I had to click on each photo to enlarge it and really take a good look. That is my kind of art. 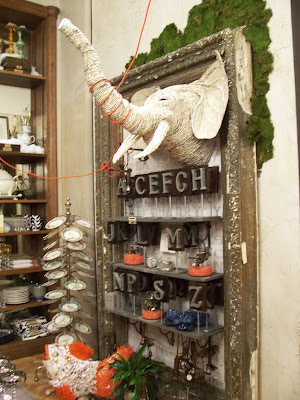 An Anthropologie just opened near me. Honestly, I thought it was make-up and stuff. Just might have to check it out for the art, alone! hi Ann, I enjoyed the paper sculptures, how exciting!! Andrew is an inspiration! !